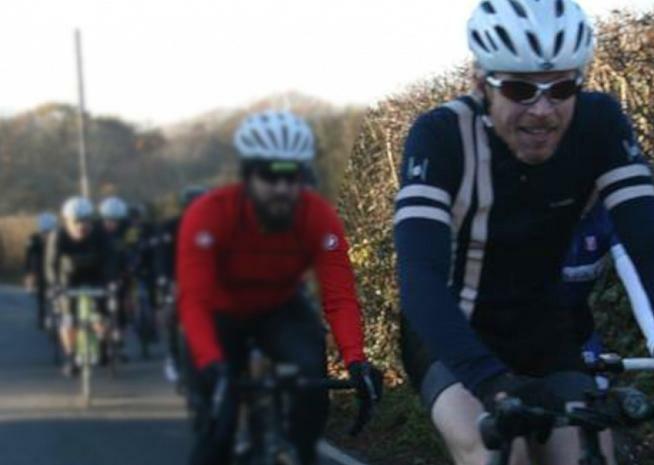 Torm are a small, independent cycling clothing company based in beautiful East Kent. Run entirely by just two people, Paul and Al, Torm jerseys are sold exclusively online and through the pair's bike shop, SP Cycles. 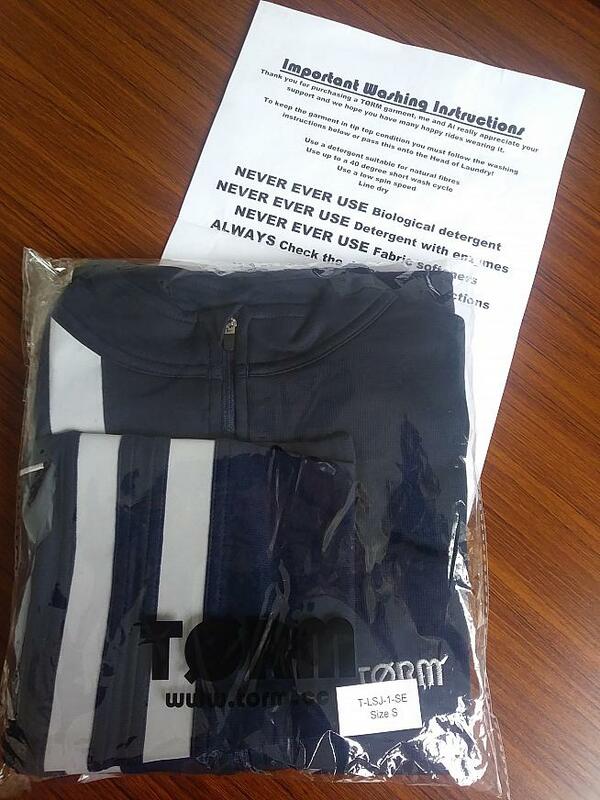 Torm jerseys enjoy a strong reputation among cyclists "in the know", with reviewers regularly praising the quality and value for money of their merino-blend SportWool fabric. 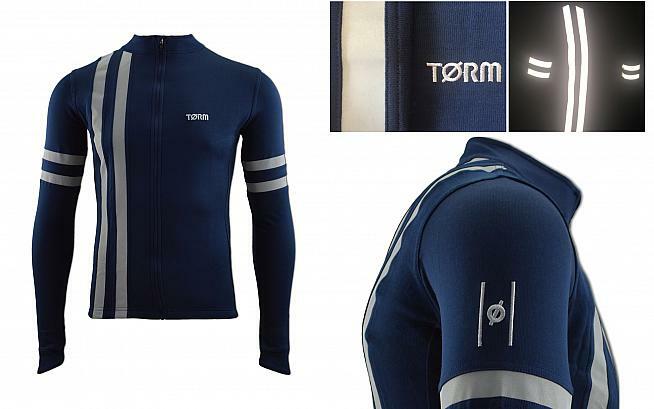 The Torm LE5 jersey features reflective detailing to boost visibility in gloomy winter conditions. We reviewed their T8 jersey back in 2015, and the latest versions - including the LE5 that I've been testing - have seen further improvements. "The pockets have been optimised and strengthened to allow the storage of bigger phones in the zip pockets, zips reversed for a cleaner look," explains Paul. "The long sleeves have been lengthened and the cuffs tightened to give better coverage when adopting an aero position, and now with 39% merino wool in the SportWool blend." Without further ado then, let's get into reviewing the Torm LE5 jersey. There's a lot of great sizing information on Torm's site and I went with the LE5 Limited Edition in size small at a retail price of £74. The jersey is only available in one colour - deep navy. The LE5 arrived in standard packaging, but with a printed note from Torm thanking for the purchase and washing instructions. I thought that was a nice touch. No frills packaging but useful care instructions and a handwritten note from Torm. Removing the packaging, the first thing you're struck by is the quality and feel. The material has a comforting thicker feel to it - comforting because it's designed for colder weather. Unfolding the jersey I found myself thinking, "this is a good-looking piece of kit". The LE5 is a smart combination of practicality and aesthetics with a cool, retro feel. The design incorporates two reflective stripes around the upper arms and two more vertical reflective stripes starting at the jersey's base and wrapping over the shoulder to finish at the base on the other side. Other fetching appointments include the stitched logos on the arms and across the left breast. Five rear pockets - two zipped - provide generous storage for your snacks and tools. The attention to detail and quality continues throughout. 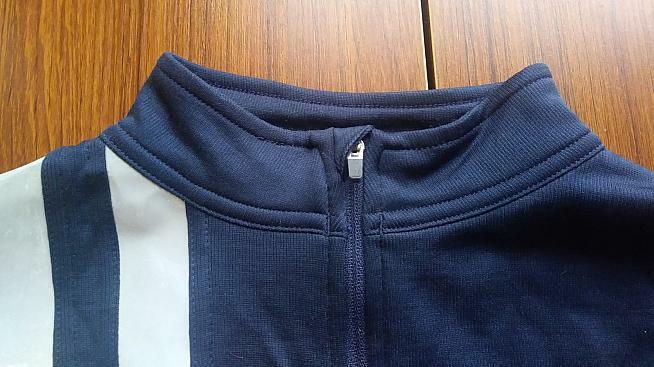 After repeated tests, all zips smoothly open and close. 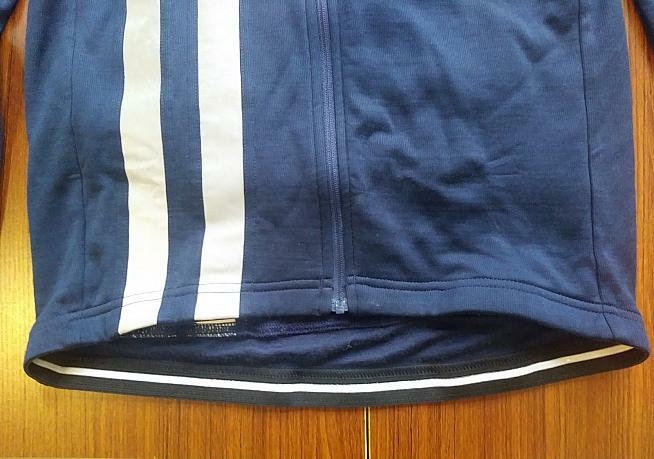 The main zip has a small housing on the top of the collar for it to hide when fully zipped up. The stitching throughout is excellent, with flat locked seams giving everything a feeling of being built to last. There are five pockets across the back - three deep pockets and two shallower with zips. Again, the attention to detail is apparent. Stitching is robust, giving you confidence that that emergency gel you've stowed in the pocket will still be there when you hit the wall. I have one of those awkward, lanky bodies - 6'2" with a 30 inch waist. I usually have trouble finding clothes that fit through both the waist and chest with the right arm length. I normally compromise going with tighter body fit and shorter sleeves. The LE5 fit very well, with a snug fit through the waist and chest, and the arm length is great. Performing twists and stretches that no-one riding a bike will ever do, unless reviewing kit thoroughly, the full-length silicon gripper around the waist performed brilliantly preventing the jersey from riding up. Through the waist, chest and shoulders the LE5 was definitely non-restrictive. I did find having the jersey fully zipped up was tight around my neck. With the extended sleeve, the cuff could perhaps benefit from the addition of a thumb hole to anchor the jersey in place before putting on gloves, eliminating any skin exposure. I suppose Paul and Al may have decided not to do this because the extra length needed to make the sleeves comfortable when in an aero tuck would mean you'd be swimming in excess fabric at other times - which is most of the time, to be fair. The SportWool fabric helps wick sweat and kept me warm and dry on autumn rides. The jersey is well constructed with quality stitching that looks made to last. The LE5 arrived at the perfect time - the weather was forecast to start turning for the worse and I had three separate rides planned that week for a total of 180 miles: an evening chain gang, a local café-organised social spin with a brewery tour after, and a reliability trial. The three spins was certainly enough exposure to inclement weather to see how well the LE5 performed. Also, all rides were with friends and clubmates, giving a chance to get some feedback on what others thought of how the LE5 looked. Across all three spins I wore a thin base layer and the LE5. The final test was to see how the jersey held up when, after all this cycling, it was put through the wash. The first spin was a local chain gang. There was quite a bit of moisture in the air and climbing into/out of Brighton a thick fog. A friend and I usually cycle over and back making for 40 miles. Descending into Brighton the fog was so thick we couldn't even see the city lights. When we emerged from the fog, arriving at the track my friend commented that he was cold. I wasn't. One point for the LE5. A couple of times through the night I looked down and saw moisture clinging to the jersey. Cycling back over Ditchling Beacon the fog was wafting about in thick, clinging clouds. I must say, though, I didn't feel wet or cold at all. When I got home, after a sweaty 20-mile chain gang at 22mph and 10-mile spin back through wet fog I was still a comfortable temperature. Taking off the jersey it was still dry on the inside, as was the base layer. Chalk it up to the construction, which incorporates SportWool (a fabric that has a layer of super fine merino wool on the inner face and tougher polyester on the outside), which wicks away sweat keeping you comfortable. My admiration for Torm is growing! The next test ride was a short 25 miler (with 5 miles to and from): a small loop from a local café before sampling delicious beers from a local brewery. New favourite word I learned on the day, 'sessionable': when a beer is low enough in alcohol you can drink it all day. The spin was a good one. A beautiful crisp, clear day this time. There were a couple of more intense miles where we were all sweating, but again, the SportWool did its job and I stayed dry and comfortable. The other benefit of the wool, it helps to prevent odours - which after a few rigorous miles are bound to blossom. So what comments came in about the LE5? Coming away from the beer tasting I promised a few people to ping over the link to Torm, because they thought the kit was smart. Definitely quite a few conversations over the jersey's looks and questions on its performance. The final test was the East Sussex Cycling Association Reliability Trial - only 50 miles, but a group of six of us from my club spun over and back with the opportunity to knock out a final century before the end of the year. Leaving the house at 7am to meet up with everyone, we were all freezing. There was a thick frost on the fields as we spun over to the start and we were miserable - maybe me most, as my gloves from the previous day hadn't fully dried and I was still wearing shorts. If you're going out for a spin and it's a cooler 5 degrees or lower, bring another layer to put over the LE5. Through my arms and chest, I felt cold. By the time we started the reliability trial, it had started warming up. Once again, I didn't overheat, I didn't feel uncomfortable or sweaty. I did have a slight difficulty retrieving things from the pockets - they were a bit high on the back. Also, the reflective stripes around the arms aren't stretchable, so when clearing the nose during a ride the arms became slightly tight. During the spin and afterwards, people noted the jersey, saying they'd been looking at Torm or asking questions on its performance. Quite a few comments came over that the kit looked good. The note from Paul and Al includes clear washing instructions. Follow them and you'll be fine. 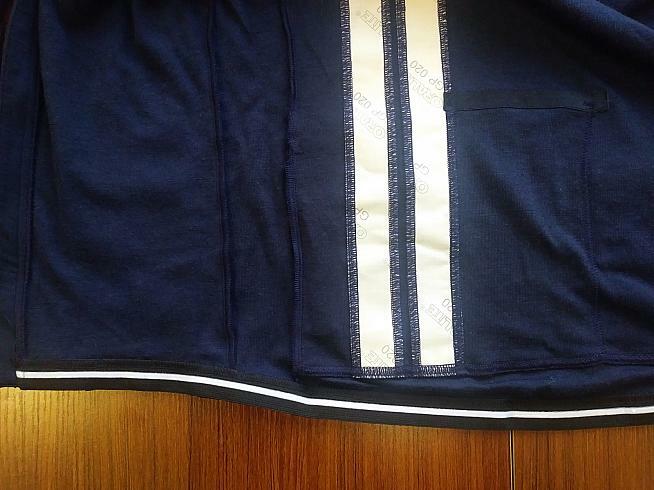 There's been no shrinkage across the garment or around the reflective strips. Nor is there any colour bleed. This is a well constructed garment that will last. After spending a few miles in the LE5, I'm sold on the jersey - and on Torm as a brand. Paul and Al seem lovely, genuine people concerned about making sure their customers are happy. Exactly the type of attitude you want when buying anything. The LE5's quality and looks are great, and these are matched by the excellent performance. It's also a great price. If you're looking for a versatile jersey that will see you through three seasons - with reflective details that help YOU stay seen too - then check out Torm. 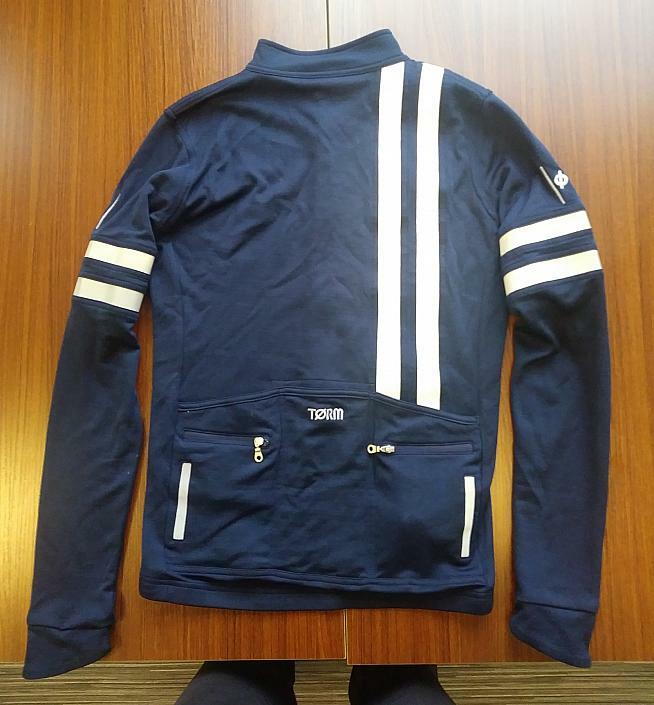 Torm LE5 Limited Edition Full Zip Reflective Jersey, £74 from spcycles.com.